The net- and tarpaulin-covered collections of cargo are ‘resin’ (hard plastic) mouldings I bought separately via eBay. 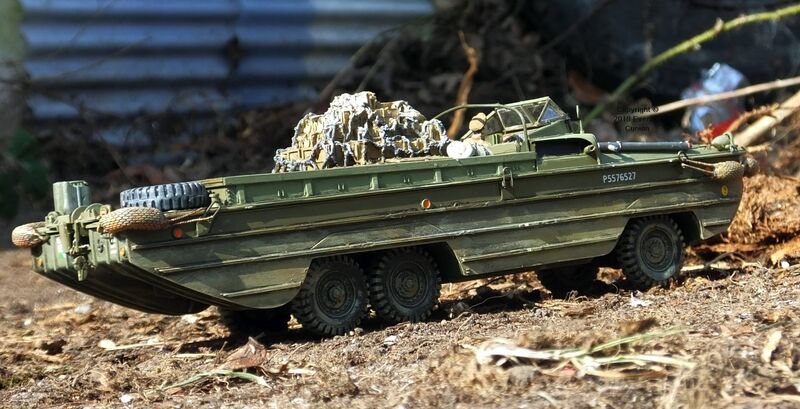 The driver is from the Miniart set of World War 2 vehicle drivers (sold separately). He is the only British driver in the set. 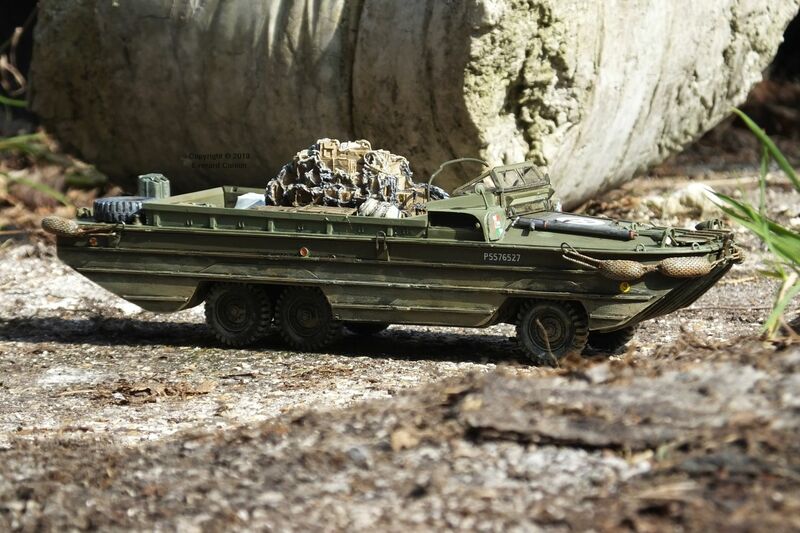 (I have seen US Marine Corps Duck crewmen in this scale, but they are standing.) The space in the cab is tight, which is why the steering wheel is positioned too high. It is not connected to anything except the driver’s hands. (I omitted the steering shaft.) 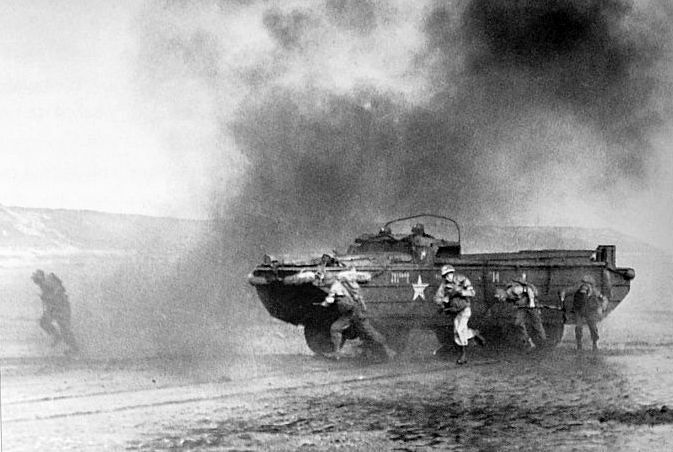 And British Army Duck crews seemed to usually wear leather gherkins (whatever they are called) which he does not have. 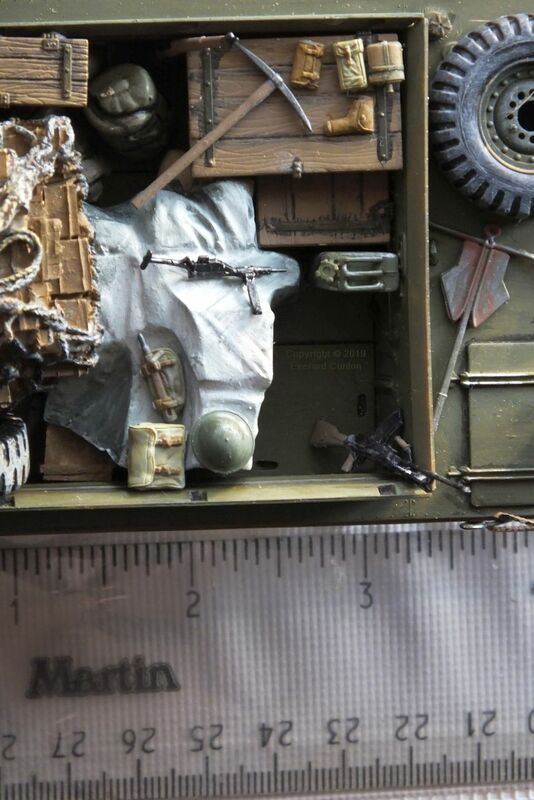 The other details including ammunition boxes, spare wheels, and Jerry cans all come with the Italeri kit. However, I added some extra items to the cargo later, as described farther on. The kit is good, although fiddly. Its main drawback is the random allocation of part numbers on the runners (‘sprues’) which makes finding some small parts time-consuming. I used acrylic paints and I used transfers from a sheet by Bison Decals that I bought separately. 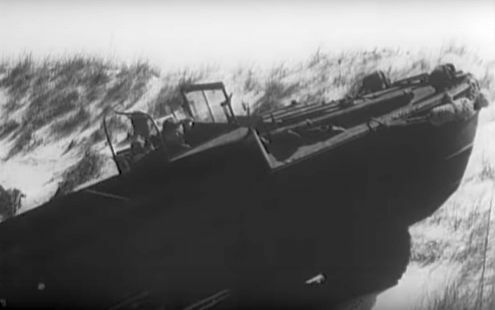 It covers several amphibious vehicles used by the British Army in Holland in 1945. There is also a Bren gun leaning in the corner at bottom right and, barely discernible, a rifle poking up out of the darkness to the left of the ammo box at upper right. I am sure carrying weapons loose like that breaks half a dozen regs! 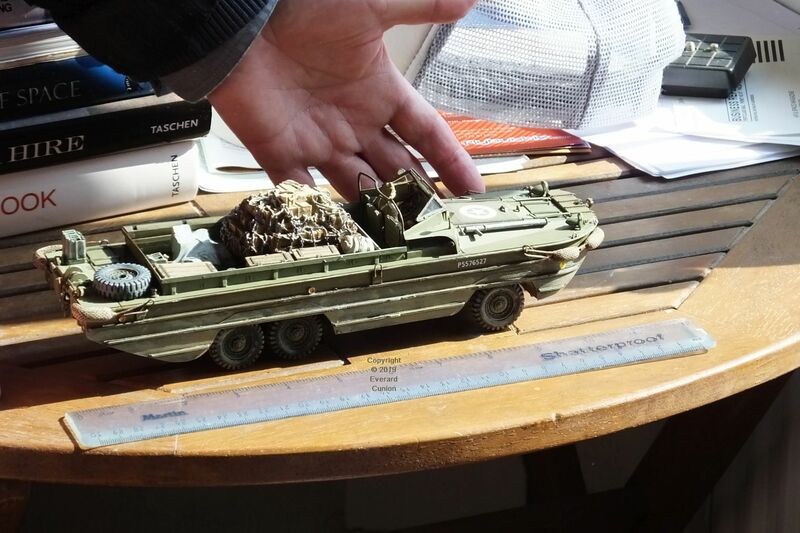 I used two sets of figures to augment the DUKW in addition to the driver: Master Box 1/35th scale World War 2 era women and Tamiya 1/35th scale World War 2 British soldiers. The skirts are made of two panels — in one case three panels — and I needed to use a small amount of filler where there was a gap in some of them. The figures are two inches (five centimetres) tall. I used acrylic paints except for the dark red skirt and the flesh tones, both dark and light, which are Humbrol enamel. Although they are sold as generic World War 2 era women, they are specifically French. At least the one wearing wedge shoes is. (She is also wearing the red pillbox hat and retouching her lipstick.) Wedge shoes were invented during the isolated development of high fashion in Paris during the German occupation, the market for that expensive hand-made clothing being the wives and girl friends of high ranking German officers. The British soldiers have more parts than the women, so they take longer to build, but I encountered no problems other than breaking the stock of the Sten gun while removing the gun from the runner. The kit comes with a spare, but I broke that in the same way. I glued both back together, but naturally the join is not perfect. Some called it a lame duck. Others said it would be a sitting duck. And a few predicted it would quickly become a dead duck. However, the conservative leadership of the US military was soon won over by the new machine’s extraordinary capabilities.